- Original contribution: include controlled and randomized trials, observational studies, as well as basic research with laboratory animals. Original articles should contain: Id(s) of Author(s), indicating the corresponding Author, Abstract, Keywords, Introduction, Material and Methods, Results, Discussion, Conclusions, Acknowledgments (if necessary), Support (if necessary) and References. - Case Report: description of individual clinical or surgical condition, especially rare or never described, as well as innovative methods of diagnosis or treatment, focusing on the case reported and not the methods (to give emphasis to the method, the authors should prefer the "Technical Report" style). The articles of clinical case reports should contain: Id(s) of Author(s) indicating the corresponding Author, Abstract, Keywords, Introduction (brief) temporizing main topic related to the case with the specialized literature, Case Report, with the presentation of the clinical case, with results before and after (if applicable), Conclusions, Acknowledgments (if necessary), Support (if necessary) and References. - Technical Reports: description of techniques, procedures, as well as innovative ways to diagnosis or treatment with emphasis on the method and not on patient outcomes or illness (to focus on the evolution of the patient or disease, prefer the "Case Report"style). Articles of Technical Reports shall include: Id(s) of Author(s), indicating the corresponding Author, Abstract, Keywords, Introduction (brief), Description of the technique reported, Discussion (temporizing of the technique and its innovations, potential and/or limitations to those commonly described in the specialized literature), Conclusions, Acknowledgments (if necessary), Support (if necessary) and References. - Reviews or Updates: critical review and ordered of the literature in relation to a certain topic of clinical importance. Professionals with recognized expertise are regularly invited to write reviews or updates. However, Authors they deem to contribute with analysis/studies on specific topics may send their manuscripts to our editorial considerations. A Review or Update manuscript shall contain: Id(s) of Author(s), indicating the corresponding Author, Abstract, Keywords, Introduction, Materials and Methods (describing the parameters used for selecting references as well as other parameters used), Discussion, Conclusions, Acknow-ledgments (if necessary), Support (if necessary) and References. TITLE: bold and centered at the top of the first page, using upper case font Times New Roman size 12. TEXT: must be in at most 12 pages in electronic form using text editor such as Microsoft Word, with single spaced, no empty spaces between paragraphs and font Times New Roman size 11. The margins should be 3 cm to the left and right and 2 cm above and below. The text should be justified to the page..
ABSTRACT: owning about 200 words, followed 3-5 keywords. Write about the motivating factor for the manuscript using simplified sentences, without presentation of items listed with topics. The Abstract should be a single paragraph. Symbols that are not commonly used, equations, diagrams, among others, should be avoided. To choose the keywords, use the "Descriptors in Health Sciences" DeCS / BIREME available in http://decs.bvs.br. If no descriptors available to cover the topic of the manuscript are found, may be terms or expression of known use. INTRODUCTION: should contain the theoretical searched for the preparation of the article. If necessary, the text may be subdivided into subtitle(s) suggestive(s), written with left alignment and bold. The introduction should be completed with the hypothesis and purpose of the study, without evidence them into subtitles. MATERIAL AND METHODS: in this section, Authors should detail the materials and methodological resources to perform the work. Abbreviations: for units of measure, use only the units of the International System of Units (SI). Use only standard abbreviations and now, avoiding to include them in the title and abstract. The full term should precede the abbreviation when it is first utilized, except in the case of common units of measurement. RESULTS: Figures and Tables (if necessary) should be included by the Authors in the text where its visualization facilitates understanding of the study presented. In Case Reports and Technical Reports the results and discussion are not specified separately. In the text, references to tables or figures must be in Arabic numerals. Note that fact should not be taken elements denominating them as schema, diagram, graph etc. The graphics of the article should necessarily be called Figure or Table. It is recommended that the total of Figures and Tables is not more than eight. * Reviews and Updates are exempted this item. DISCUSSION: the Authors should comment on their experimental findings, contextualizing them with previous records in the specialized literature. CONCLUSIONS: the Authors should respond affirmatively or negatively on the hypothesis that motivated the study, through the achievement of the proposed objectives. In the last paragraph, the authors may express their reflective contribution (personal nature), and/or perspectives on the study. FINANCIAL SUPPORT: the Authors should indicate the sources of research funding (funding agencies, companies, etc). REFERENCES: should be numbered consecutively according to the order in which they are first mentioned in the text and normalized according Vancouver style. The titles of Journals should be abbreviated according to Index Medicus (List of Journals Indexed in Index Medicus, available at http://www.nlm.nih.gov). Use Times New Roman font, size 9. List all Authors up to 3, when they are 4 or more, list the first 3 followed by “et al”. References are those of the Authors and should conform to the originals). After the reference, attach the document evidencing approval of the study by the Ethics Committee for experimental studies in humans or animals. Case report of a patient who has not undergone experimental intervention waiver of this formality, but must have permission of the patient. 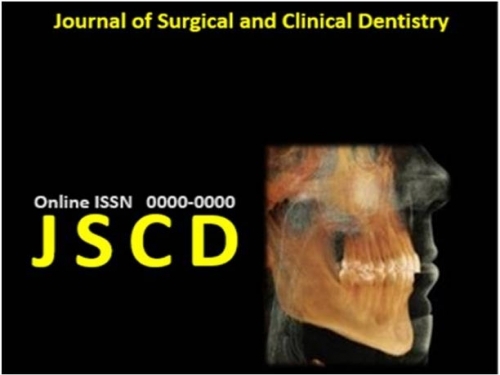 Prof. Dr. Mario Neto (Editor-in-Chief of the Journal of Surgical and Clinical Dentistry – JSCD).